It is said that relatively few shows out there break even, let alone make a profit, making investing in live theatre rather risky to say the least. What Paul O’Donnell describes as a ‘jukebox musical’, is really, presented as it is here, the storyboard for one. To ‘see’ the whole thing requires the use of CGI – collective group imagination. 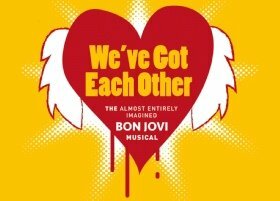 We’ve Got Each Other has as its protagonists Tommy and Gina, from the Bon Jovi song ‘Livin’ On A Prayer’, and thus it is hardly a spoiler to reveal that Tommy “used to work on the docks” while Gina “works the diner all day working for her man”. There are a whole load of supporting characters too, and as the descriptions continue of what happens in certain scenes, there’s fun to be had whilst engaging one’s imagination in making parallels between what is going on in O’Donnell’s yet-to-be-produced musical and other narratives in other shows. He’s playing it a little safe, to appeal to as wide an audience as feasible. This is, however, the abridged version: the running time of the full musical is, apparently, 2 hours and 35 minutes including a 20-minute interval, but the salient points are presented in one hour. With a copy of the script and a ‘techie’ (who expresses some frustration with the number of scenes, and thus lighting cues, being skipped over), O’Donnell provides an almost forensic amount of detail to the point where, rather ironically, not quite so much imagination is required as the audience was led to believe, particularly when the recorded music and the lighting was going on during the big, flashy musical numbers. There’s a long blackout to signify the interval, during which O’Donnell makes some wry observations about how much money theatres rake in most members of the audience file out of an auditorium to buy ‘overpriced’ drinks. Even those dinky tubs of ice-cream are £4.50 each these days. For those interested in how shows are put together, practically every aspect of the on-stage action is described. Quite what the stagehands are doing during the big shows is often unknown, and therefore largely unacknowledged. Here, then, is a rare opportunity to give credit to their work, and there are repeated references too to the choreography, for which Bruno Tonioli of ‘Strictly Come Dancing’ fame is apparently responsible for. Some thinly veiled points about, for instance, the use of certain accents to portray characters perceived to have lower than average incomes, put certain theatre industry practices in the spotlight. There are various iterations, versions and tempos of ‘Livin’ On A Prayer’, but it never feels too repetitive, and every lyric is mined for its narrative potential. So various characters are going experiencing the sort of difficulties that one encounters in life, and it’s “so tough, it’s tough”. O’Donnell gets more and more involved as the show goes on, progressing from sitting in the director’s chair describing stage directions to giving an all-out performance of one of the big musical numbers. All very modern, and all very entertaining, this show is a fascinating insight into the world of making musicals. With the modern jukebox musical traditionally comes a multi-talented cast, a live band (or orchestra if you are lucky), opulent sets and decadent costumes, extravagant dance routines, dramatic key changes and the odd hydraulic lift or two. We’ve Got Each Other has none of these things (they cost a lot of money), but Paul still tries to create this all singing, all dancing spectacle using the powers of your imaginations.